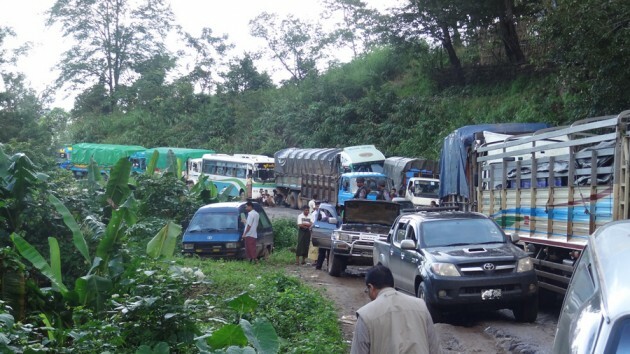 The Karen State Ministry of Transportation and Communication will ban, from this month, all unregistered vehicles from traveling between the towns of Hpa-an and Myawaddy. Saw Khaung Pan Htaw, a staff member of the Minister of Transportation and Communication, said that the ban is necessary as ASEAN countries will begin trading in Karen State in June, and it is inappropriate that foreigners witness local people driving without registration. Saw Khaung Pan Htaw told Karen News. Saw Khaung Pan Htawy stressed that the ban will only be in place on the use of unregistered cars on the Hpa-an to Myawaddy route and that the Karen State government does not have any plans for arresting drivers or confiscating vehicles in other areas. Saw Kyar Doe, a driver who has an unregistered car that he relies on to make his living on the Hpa-an – Myawaddy route spoke to Karen News. Drivers in Myawaddy told Karen News that registering a car in Burma is expensive, it depends on engine size but it is at least 50% of the cost of the vehicle. An unnamed driver explained. Local residents are expecting that when the ban comes into force prices will go up. Car drivers who rely on income that they get from driving unregistered cars for a living will face problems and it is expected that transportation costs between Hpa-an and Myawaddy will rise. The Hpa-an to Myawaddy mountainous route is used daily by as many as 1,000 vehicles, this includes private cars and commercial vans and trucks. The popular route is in constant use and at times is jammed with traffic and passengers traveling from Burma to the Thai border or from the Thai border into Burma. There is a constant stream of products, both legal and illegal between the two countries. The route is also used for smuggling illegal cars and motorbikes from Thailand into Burma.